Did the urologist tell you why mitomycin instead BCG? Usually BCG is the treatment of choice for high grade or recurrent bladder cancer and mitomycin is used only when a patient cannot tolerate BCG. 3 years 1 month ago	#50705 by Flamenco. I am not a doctor, but my interpretationof the biopsies would mean that in the A) the pathology shows that it is lowgrade, but that there were no fractions of muscle layer in the sample examined. and in B)there were fragments of muscle, but no evidence of cancer. I would request a second opinion, or at very least discuss this with your team, and if you are not satisfied with their explanations, seek another opinion, as the biopsy A should have fragments of muscle to show that the surgeon went deep enough to be sure there was no invasion. I don·t believe the fact that they have rung you for weekly treatments means anything ominous, probaly just that they want to nip these low grade tumours in the bud, particularly as you said there were several. 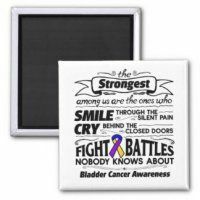 My 57 year old husband was diagnosed in July 2014 with kidney & bladder cancer. August 2014 1/2 of the left kidney removed and 2 low grade non-invasive tumors were removed from the bladder. Long story short after multiple cystoscopy and removal of many pillary tumors this January the dr want to do a TUR and start mitomycin treatment once a month. The dr told me that treatment once a month would be enought because the tumors looked low gràde but then the pathology report came back and we received a phone call saying that my husband has to start weekly mitomycin treatments. This is what the pathology report had. My question is does this mean it's invasive at the ureteral orifice? We go this Wednesday to start his weekly treatments. PAPILLARY UROTHELIAL CARCINOMA, LOW GRADE, NON-INVASIVE. Urothelial mucosa with hyperplasia and Von Brunn’s nests, no tumor present. Last edit: 3 years 2 months ago by kajunnana.